The process of getting a job involves a lot of formalities. First, you need to qualify for the interviewing sessions. When interviewers decide to hire you, the employer shall furnish a professionally written job offer letter to you. In return to Job Offer Letter, you have to write a job acceptance letter to the employer in case if you want to join the job. This formal letter has to be written in professional style. Acceptance letter for job offer should be concise and well written. 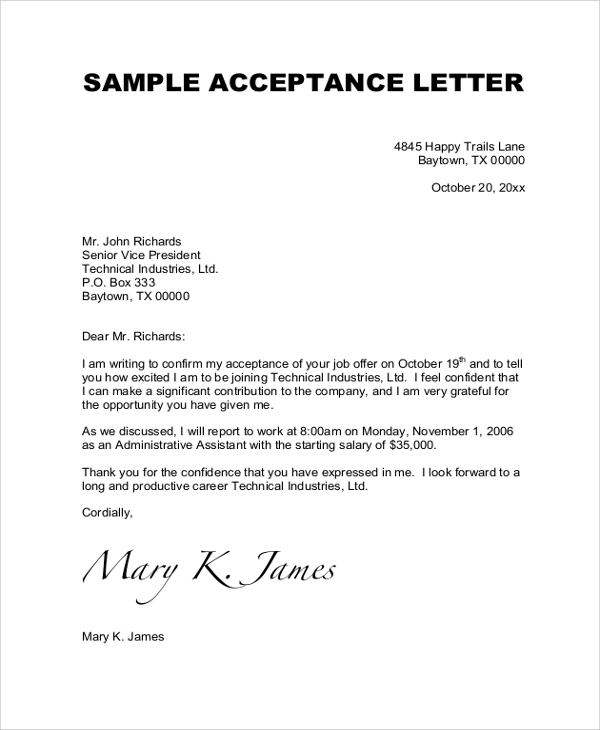 This is a sample letter for those who are struggling with job offer acceptance letter writing job. Download this sample, customize the letter and prepare for sending it to your new employer. Sometimes, potential employers send job interview letter to the candidates. 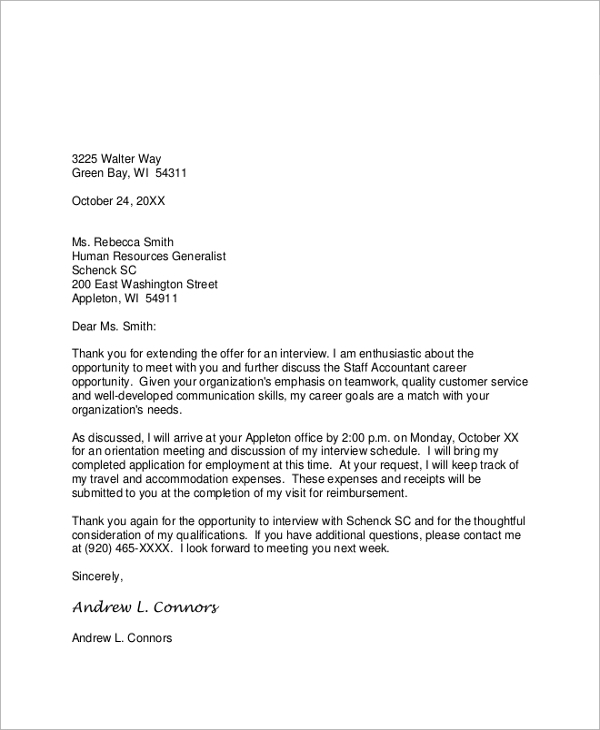 Employer notifies you to join job interview process, and you in return have to acknowledge the letter from the employer through writing interview acceptance letter. When an employer offers a job to the candidate, who has been selected through the interviewing process or other processes, a formal joining letter has been sent to the person. Job acceptance letter should be written in reply to joining letter that has been sent by the employer. 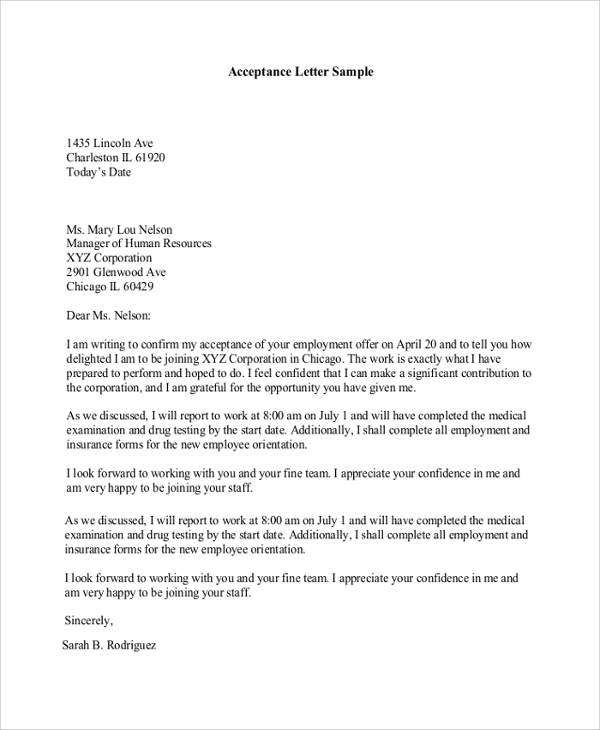 Here is a coordinator job acceptance letter, which can be used by those who have obtained job joining letters from the employers. Write the acceptance letter in professional style with this template. 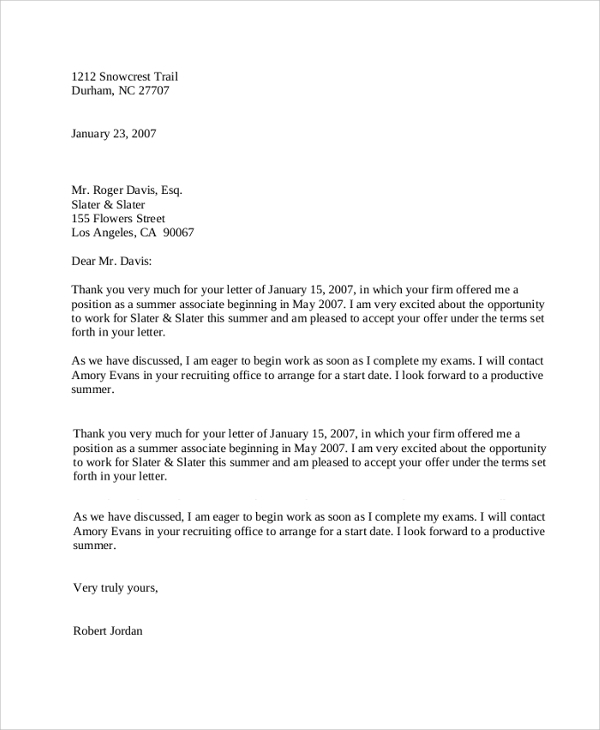 A job acceptance letter has been written in reply to a joining letter. A joining letter is typically furnished by an employer to a person who has qualified the job interview process successfully. The employer sends the joining letter to ask the person to join the company from the mentioned date and time. Now, it is a professional etiquette to send back a Job Acceptance Letter to the employer. Typically job acceptance letter comes with a message that you are willing to work for that employer. It is a thank you letter and can also be considered as job offer acknowledgement letter. Who should use Job Acceptance Letter Samples? 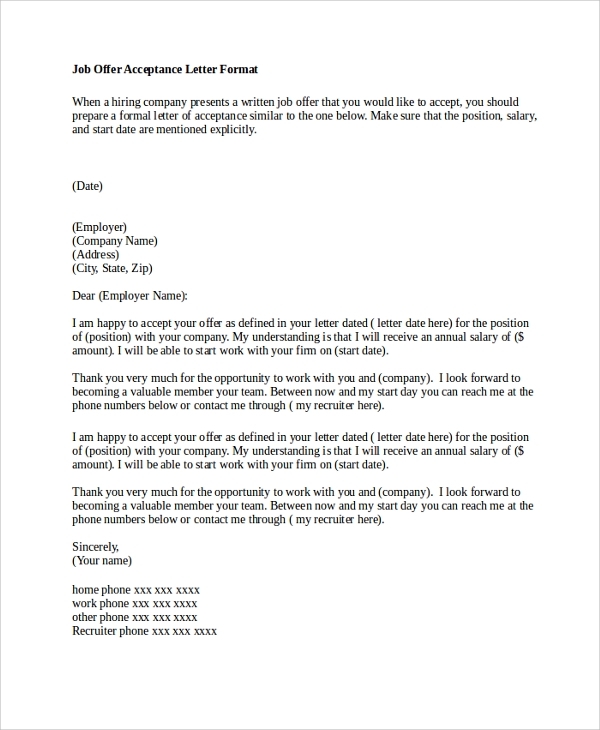 In order to write job offer letters, many users or HR department of a company uses online job offer letter sample. Similarly, for job acceptance letter, employees can use the samples or templates that are available online for writing job acceptance letters. Writing Job Acceptance Letter is not easy, especially if you have received your first joining letter. You would definitely not want to create a bad impression in the mind of the new employer by giving a poorly written job acceptance letter. 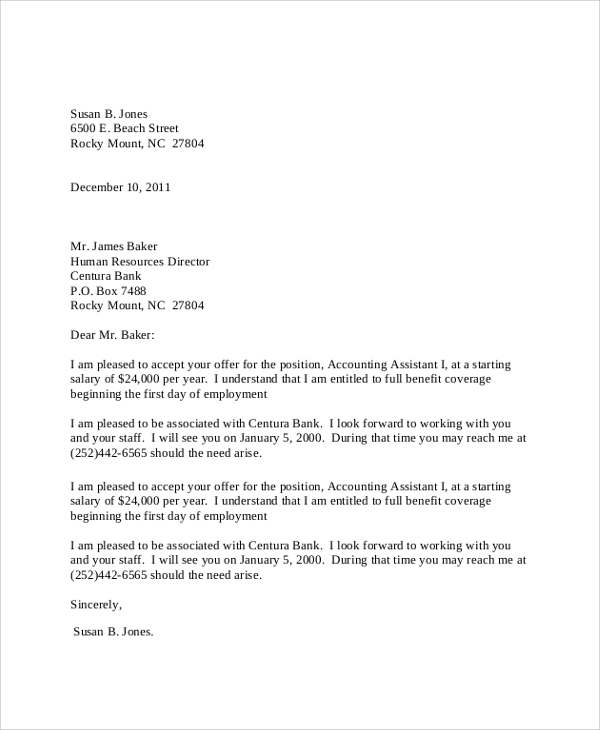 To create a good impression, you should write job acceptance letter perfectly. It should not be elaborated. It must be concise and professional. 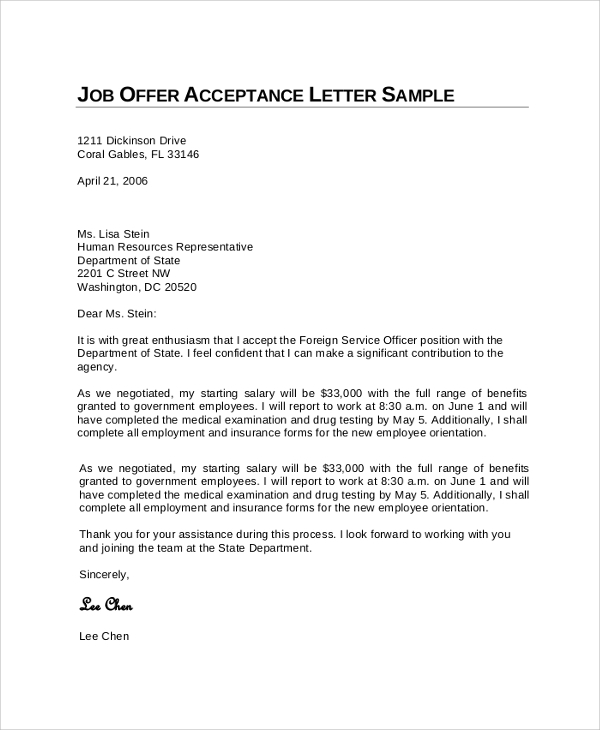 To write it perfectly, using sample job acceptance letter is highly suggested. Many of us do not know the professional etiquette of writing letters. For example, it is difficult to write the first job acceptance letter for a person. All of us go clueless about what should we write. When you do not know writing job offer Acceptance Letter, you should opt for the online samples. Plenty of online samples can be found. Using them is always beneficial. First of all, using samples will help you to understand how professional job acceptance letters are written. Secondly, samples will help you to understand the format of such letters. Thirdly, it will save your time of writing job acceptance letters. The process of awarding a job to someone involves a few formalities. The employer needs to send a joining letter to the selected persons, while you need to write back an acceptance letter stating acknowledgement of joining letter. To write a job acceptance letter, use the online samples. It will make the job hassling free.